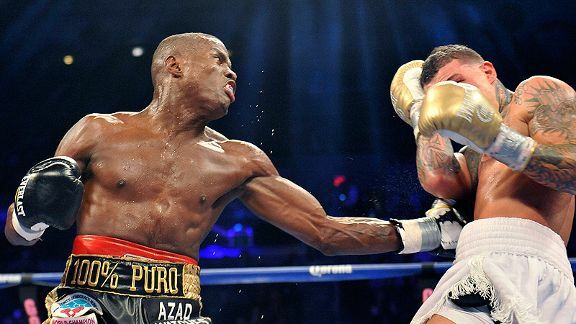 ATLANTIC CITY, N.J. – Middleweight titleholder "Kid Chocolate" Peter Quillin found himself in some trouble in the middle rounds against Gabriel Rosado but tore open a cut over his left eye in the ninth round. Joe Camporeale / USA TODAY Sports Peter Quillin, left, cut Gabriel Rosado over the left eye to score a TKO victory. It proved to be decisive as the fight was stopped because of the cut 40 seconds into the 10th round as Quillin retained his title for the second time on the Bernard Hopkins-Karo Murat undercard on Saturday night at Boardwalk Hall. Quillin had a second-round knockdown, giving him 12 knockdowns in his past four fights and was ahead on all three scorecards -- surprisingly wide scores of 90-80, 89-81 and 87-83 -- at the time of the stoppage, which Rosado complained bitterly about. "I feel good. I feel like anybody would defending their title," Quillin said. "It wasn't easy but I earned every bit of it. I'm not a judge and I'm not an official. I'm a fighter. The doctors do what they have to do to make sure the fighters are safe. I was dedicated to this fight and to defend my title and I worked hard." It was Rosado's second stoppage loss in a middleweight title fight this year. In January, he was also stopped on cuts in the seventh round by Gennady Golovkin in New York. In the second round, Quillin backed Rosado into a corner and dropped him to his knees with a left hook near the end of the round. Another left hook rocked Rosado late in the third round. Rosado, with many of the fans from his hometown in nearby Philadelphia cheering him on, had a big fourth round. He rocked Quillin repeatedly late in the frame and seemed to have him in a bit of trouble as the round came to an end. The 27-year-old Rosado (21-7, 13 KOs) began to showboat in the fifth round, waving one hand and punching with the other as the crowd went wild, but Quillin appeared to have recovered from the difficulty of the previous round. Quillin (30-0, 22 KOs), 30, of New York, who seemed to lose some steam in the middle rounds, came back with a good ninth round in which he opened the cut. Early in the 10th round, with the cut looking bad, referee Allen Huggins called timeout to have ringside doctor Blair Bergen examine the wound and he asked Huggins to stop the bout, which he did. Rosado raged at the decision. "I was walking him down and backing him up. I was hurting him," Rosado said. "They knew he was getting hurt and they stopped it. I was hurting him in the later rounds and I knew the key was to keep him up against the ropes. I deserve a rematch. This is the story of my life. I'm the real Rocky Balboa." According to CompuBox statistics, Quillin was credited with landing 88 of 349 punches (25 percent) and Rosado with landing 80 of 297 blows (27 percent). The victory could pave the way for Quillin to make a defense in early 2014 against fellow New Yorker Daniel Jacobs. Quillin doesn't care who he fights. "I'm ready to fight anybody they put in front of me, Sergio Martinez, Alfredo Angulo, be it whoever," Quillin said. "I'll defend my title against anyone, including my mother. I'm just thankful to be here for the victory and fight at this level." Heavyweight Deontay Wilder, the last American man to claim an Olympic boxing medal when he took bronze in the 2008 Beijing Games, has still never been past four complete rounds as he knocked Nicolai Firtha out with a booming right hand in the fourth round. Firtha became the third man to take Wilder into the fourth round, but he was a sitting duck for Wilder's powerful shots. When Wilder (30-0, 30 KOs) knocked him down for the third time in the fight, referee Lindsey Page immediately waved it off at 1 minute, 26 seconds. Firtha (21-11-1, 8 KOs), 34, of Akron, Ohio, rushed at Wilder, 27, of Tuscaloosa, Ala., at the opening bell and shook him with a right hand, but Wilder quickly recovered to drop Firtha to his knees twice in the round. The first knockdown came from a left jab and the second on a right hand to the side of the head. Wilder landed several hard shots in the remainder of the round to leave Firtha with a bloody nose. In the third round, Firtha took some heavy shots and went down between the ropes, but Page ruled that he had been pushed down. Still, the 6-foot-7, 224-pound Wilder, who spent time sparring with heavyweight champion Wladimir Klitschko last year, was landing blows and beating Firtha up before drilling him in the fourth. "This is what I wanted – to box and have fun," Wilder said. "Throw some combinations, my tremendous jab, fast, stiff, and a left hook. This fight is exactly what I told them it would be. Firtha was coming to fight. I've seen him in the Klitschko camp, he doesn't have skills but he's tough. Said Firtha, "I should have gotten up, I was OK. I was in there with one of the world's best." Firtha was another in a career filled with lesser opposition for Wilder, who has been criticized for his lack of quality opponents. Firtha dropped to 3-4 in his last seven fights. Wilder and Golden Boy hope to have him step up in class next year, possibly into a title fight. "I'm right there at the door," Wilder said. "I need to have patience. I'm willing to fight and win in good fashion. Every time you come see me, this is what you're gonna get -- a knockout." • Junior welterweight Zachary Ochoa (5-0, 3 KOs) of Brooklyn, N.Y., took a couple of hard shots early on but went on to easily outbox Michael Doyle (2-6, 1 KO) of Pritchard, Ala., for a unanimous four-round decision. One judge had Ochoa winning 40-36 and the other two had him ahead 39-37. • Featherweight Braulio Santos (11-1, 10 KOs) of Puerto Rico blew out David Clark (6-3, 4 KOs) of San Diego in the first round. Santos went right at Clark and badly hurt him with a left hook and then dropped him with another hard hook. He beat the count, but was shaky and referee David Fields waved the fight off at 1 minute, 49 seconds. • Largo, Md., super middleweight prospect Dominic Wade (13-0, 10 KOs), 23, powered through Roberto Ventura (12-8, 12 KOs) of Mexico with ease for a first-round knockout. Wade scored three knockdowns against Ventura, who put up no fight. After the third knockdown, referee Ricardo Vera called off the bout at 2 minutes, 8 seconds. • In his professional debut, Newburgh, N.Y., junior welterweight Wellington Romero (1-0, 0 KOs) rolled to a shutout decision against Victor Galindo (1-3, 0 KOs) of Puerto Rico. All three judges scored the fight 40-36.